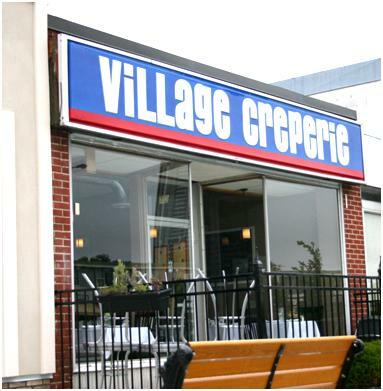 In the heart of Belmont Village announced with a cheery sign in multiple fonts, is Village Creperie. This Kitchener gem is a quiet little bistro with a warm and inviting interior. The soft lighting and welcoming staff makes diners feel at ease immediately. Most of the dishes combine local fresh organic ingredients, in a soft perfectly prepared crepe. Les Galettes are savoury buckwheat crepes containing meats, vegetables, fruits, together with an interesting sauce or cheese.The Galette fromage ($10) is a dish of fairly simple ingredients: aged white cheddar, mozzarella, chopped green onion, organic tomato, and fresh herb. This dish thrives on its simplicity and the freshness and quality of the ingredients. I was excited to try the Saumon et moutarde ($12), a salmon fillet with a mustard sauce. The crepe and sauce were delicate and flavourful, but unfortunately the salmon was a bit dry and boring. Les Galettes are accompanied by a small salad, which is a nice touch. The drink menu has a good number of selections, and something for everyone at reasonable prices. I’ll admit that the daily specials, especially the quiche, sounded delicious, but the idea of trying a quiche in an establishment with the word “creperie” in it seemed like it would be a lost opportunity. The dessert crepes ($9 each) are a perfect way to end the meal. I’ve tried the Dulce de leche. The rich and heavy sauce complemented with fresh fruit. There is also a selection of flambés, which are desert crepes ignited with cognac. The Village Creperie is a great place for a simple delicious and well prepared meal. The servers create a casual dinning experience and are very knowledgeable. Portions may be a bit small for some, but the quality of the food is generally high. Not to mention, they use local and organic meat and produce and press their own basil oil (which they use in nearly everything) from basil from their garden. I know, right? This is my favourite place to take people in KW. The portion sizes are a bit small, but I find then I have room for dessert, and really it would be a tragedy if I did not. I wish more people knew about it! Hi! Just stumbled onto your blog because of the posting about the Village Creperie. Very well-written; makes me want to try it, particularly Dulce de leche crepes! I just created a new page on my site for the review of creperies. Would you consider posting your review? I’d welcome it and would happily post a link back to your blog, if so. Thanks! Hi and thank you for giving me the opportunity to introduce our newly open creperie. We are located in beautiful Elora, Ontario not too far from K-W, Guelph and Cambridge. We are fairly new but came with lots of experience. My wifw is from France and I am from Quebec. After many years in teaching, I came back to one of my first passion. We make traditional crepes as well as innovatives one. In just 7 months we have turned this into an Art ! Crepes with sea foods such as St-Jacques, shrimps mediterraneen or caribbean and vegeterians one. Come and sample our famous chocolate mousse with one of our capuccino, latte or espresso. Every month we have new Art Exhibits, live music and are licenced. Come and visit us to discover our ihstorical building which was a former bank with it’s original bank vault used as a wine cellar with vaulted ceiling. this makes no sense that you would reply with a review of your own resto. kind of rude dont you think ? I wont be going there after that. Get your own page. you’ve always wanted.The plan even goes into far more advanced diet regime tactics, such as how often you need to consume, maintaining stable insulin levels, and even enjoying cheat meals without going overboard.Another thing that you can do to clear your doubts and to know the genuine truth about this six pack abs scam is to check various websites which have the critiques, written by people who are following this system.Do you want a flat stomach?Or, do you want to feel healthier and younger?You can not shed excess fat rapidly without obtaining a strong and sensible diet regime strategy.On the subject of shedding undesirable fat in particular physique components, extra fat stored about the stomach or abdominal can possibly be regarded as the most difficult to shed.The plan advises a workout of 30 to 50 minutes per day to be accomplished three to 4 times a week.And now, in spite of so several people asking yourself about the truth, its sales have still not been affected, hence confirming that there is nothing incorrect with this abs eating plan program.